Windows offer natural sunlight and a glimpse outdoors while keeping your home comfortably sealed against the elements and limiting the amount of ultra violet rays transmitted through the glass. 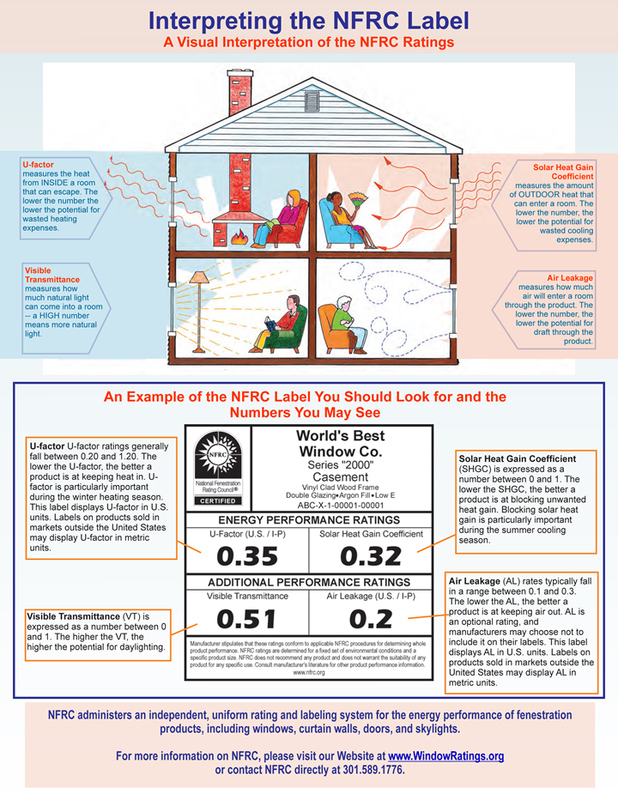 When shopping for quality window replacements, look for the National Fenestration Registration Council (NFRC) label.Here is our overview of the NFRC label and what it tells you about a window’s energy performance. U-Factor: measures how well a window prevents heat from escaping. U-factor ratings usually fall between 0.20 and 1.20. The lower the U-Factor, the warmer your home. Solar Heat Gain Coefficient (SHGC): indicates how well a window blocks heat from the sun. SHGC is expressed as a number between 1 and 0. A lower number indicates the window transmits less heat from the sun keeping your home cooler. Visible Transmittance (VT): measures how much visible light passes through a window. VT is expressed as a number between 1 and 0. A higher VT means more light is transmitted. Air Leakage (AL): measures how well the window keeps air out. AL is usually rated between 0.1 and 0.3. The lower the rating, the better the air leakage prevention. Since this is a voluntary rating, not everyone choose to display it.